Fish Out Of Water – Calling for entries! 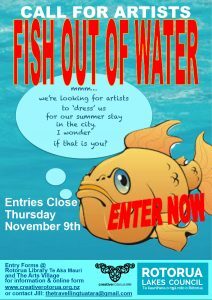 01 Nov Fish Out Of Water – Calling for entries! Fish Out of Water – an arts trail celebrating Rotorua’s magnificent lakes and fishery from December 2018 to February 2019. Fish Out of Water Art Trail is an annual summer art event which Rotorua Lakes Council initiated 14 years ago as a creative way for local artists and community to celebrate Rotorua’s magnificent lakes and fishery. The trail features 13 fish (fibreglass moulded) transformed each year by local artists and then released into the inner city streets, where they are hosted by local businesses for 6 weeks over the festive summer season, giving opportunity for both locals and visitors to walk the trail and vote for their favourite fish. One of the special features of this project is the fish are re-used each year, and at the end of summer are scraped down and re-painted white for the next year’s trail and their next transformation. CALL FOR ARTISTS is open until 9th November. Entries are now open for artists to submit their bid idea to dress one of 13 fish for its stay on land this summer. Artists are encouraged to be creative and innovative in their ideas, and bid reflecting their own unique interpretation of the trail ’s focus being to celebrate Rotorua’s lakes and fishery. Artists can choose to work on a fish individually or collectively. More details of entry requirements and design parameters are listed in the FISH OUT OF WATER 2018-19 ENTRY FORM. Artists can contact the Fish Out Of Water project manager Jill Walker at thetravellingtuatara@gmail.com with any queries. All bids must be sent in via an entry form available from Rotorua Library, The Arts Village, or downloaded here. With fish limited to 13, artists are encouraged to get their bid in as soon as possible.